IF YOU ARE DETERMINED ABOUT GETTING OUT OF DEBT GET SERIOUS ABOUT THE WAY YOU BUDGET. Your budget relies on you to report the financial information needed to ensure it balances at the end of the month. 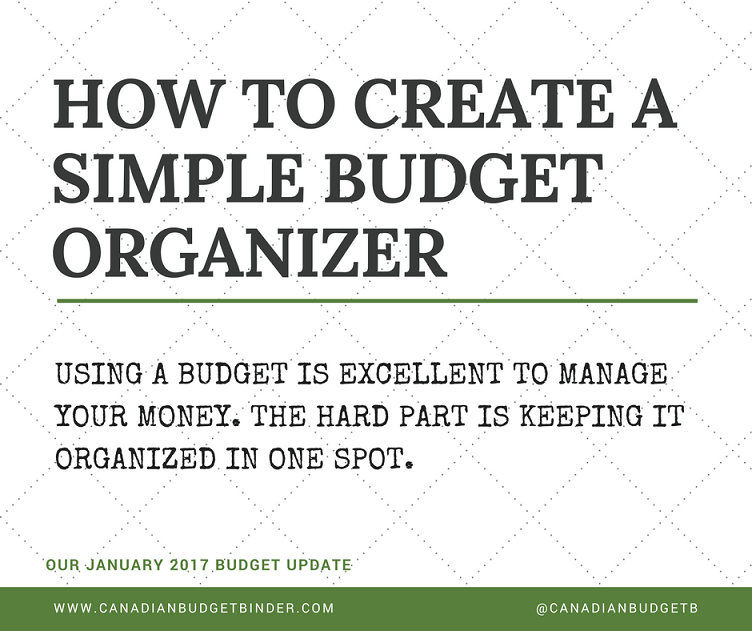 Having a budget organizer should be an important step on your to-do list when you begin to budget your money. I’ve never really shared what our budget organizer looks like on Canadian Budget Binder so today I will give you insight into our budget office. I briefly described what we’ve used in the past as our Budget Binder although we’ve since swapped over to a colourful blue sleek portfolio. Colour does matter when you choose a budget organizer. Think happy colours such as green, blue and yellow. You could be using the best budget app or budget spreadsheet available but if you aren’t keeping your documents stored in a budget organizer you’re failing before you begin. Not only is there potential to lose important documents you’re going to be tearing your desk or house apart looking for them. Even worse, you miss the expense and can’t balance your budget. As Mara points out below in her email to me she is wasting time every month trying to get her budget documentation together. I’ve been in her shoes because I’m not exactly the best organized guy out there. Mrs. CBB and I created a simple budget organizer that works for us and might work for you. I bet you’ll be shocked to see just how simple it is and why you’re stressing over nothing. I’ve been a stay at home mom for a year now and plan to stay home for the next 4 years until my daughter is in school. I’m using your basic budget template and was wondering if you could share an easy way for me to keep everything organized so I’m not wasting time every month. It’s frustrating for me and with a small child I need a system that doesn’t need much effort required. We have an office and desk set up in our basement so I’m hoping for something simple that will help me keep track of my stuff. But what about the Budget Binder you ask? The Budget Binder is a great way to store all of your budgeting needs if you want to go the binder route. The budget binder is great to keep all of your paperwork and bills sorted each month and perfect for someone who is on the go and wants to take their budget with them. What is a budget binder? Some might even call this their budget-coupon binder which is something like what we used when we were extreme couponing a few years back. It can be bulky which is why it’s not for everyone. The sleek, floppy approach to the budget organizer using portfolios works for us on a different level. 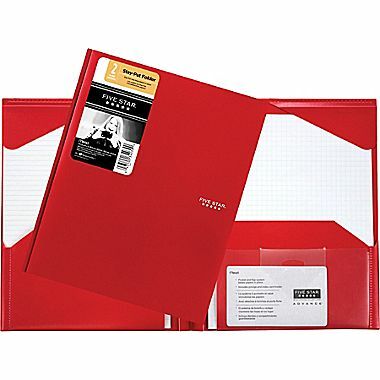 A budget binder is also great for someone who likes to go a step further in the organizational game of budgeting. Everything in its place is a great way to describe it. The budget organizer is similar but you don’t have all the frills such as a built in calculator, pen and pencil holders, zipper case, coupon holder etc. You can easily purchase something like this at Value Village for cheap and create an office to go but not everyone needs something like this. A great time to find them in abundance is just after the end of the school year at second-hand shops for under $5 each. 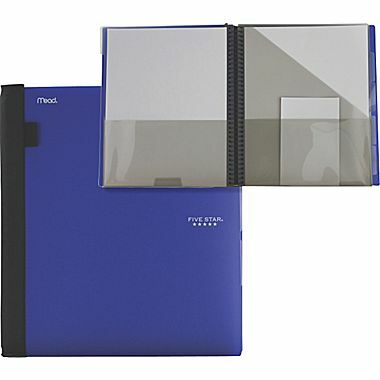 If you plan to buy new expect to pay over $20.00 for a zippered binder at regular cost or less if you can find it on sale. No matter what budget format you choose to use whether it be my basic budget printable or online excel budget spreadsheet I’d say the level of importance for organization is very high. I’ve seen some elaborate budget organizers in-store and online at Amazon Canada with fancy labelled sheets but in my opinion it’s a waste of money. It’s not hard to be organized when budgeting especially when you are in control. Spending money to save money does work but if you can save money by doing something yourself, why wouldn’t you? If you plan to go the fancy, custom route at least research your options to see what will work best for you. You might find the Dave Ramsey Deluxe Envelope system in a leather carrying case right up your alley. This comes with a $34.99 price tag though. The last thing you want to do is spend money on a budget planner and not like what it offers you even if you can return it. If you’re not up for using a printable budget, online spreadsheet or buying a custom budget planner there are other options on the market for an all-in-one budget planner that aren’t as costly and with less of the frills. Again, you can still get away with a healthy budget organizer on a frugal budget if you DIY it yourself. Your choice. Don’t fall for all the glam when it comes to getting your budget in order. If you’ve got a Staples Canada where you live or any type of store that sells office supplies that is the place you want to start your search for the perfect budget organizer. The Five Star-Advanced Portfolio Stay-Put Folder is almost identical to the budget organizer we use every day. This is all you really need if you’re using an online budget spreadsheet. The flap and pocket system will allow you to store your receipts on one side and your documents such as bills on the other. This simple budget organizer costs you $2.96 or if you’re frugal-minded like we are check the second-hand shops as there is always an array of binders and subject books available. You might not find the exact one as above but one that is similar. Alternatively, if you’d like to have more space and options available to you for your budget organizer the Five Star Pocket Poly Portfolio will do the trick. It has ample room to store more documents or to organize your receipts as you go along. If you’ve only got a few receipts every month like we do the Advanced portfolio will work fine as a budget organizer. This type of budget organizer will cost you $7.92 which is nothing compared to the prices of custom-made budget organizers on the market. If you’re a student start digging in your closet because you might already own something like the above and you won’t need to buy one. Alternatively if you’re a parent with kids in High School, College or University you might want to start your frugal budget organizer hunt with them. Buying a custom budget binder won’t make you rich, smarter or organized any better than creating one yourself. If you’re someone who might be discouraged about budgeting because you think you need to spend money on fancy budgets don’t worry it’s all about being smart where you put your money not how you decorate it. What type of budget organizer system do you use for your monthly finances? After a phenomenal December 2016 income, January 2017 seemed like a bit of a disappointment. 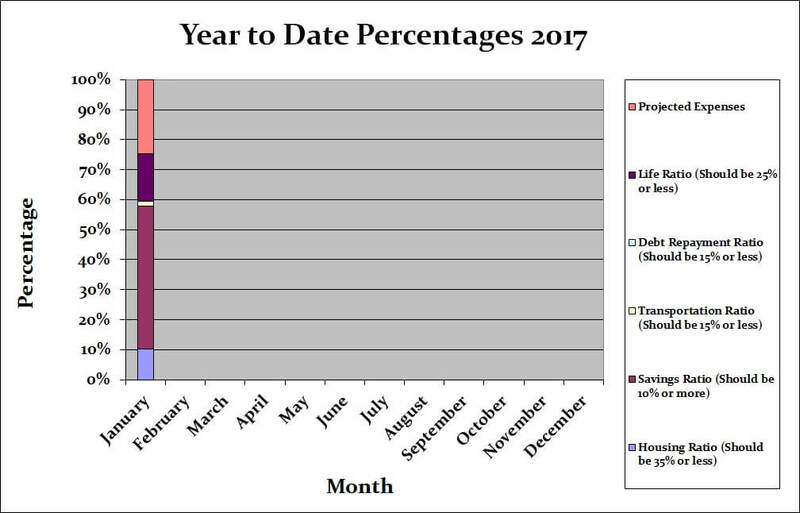 For starters any remaining pay for the end of the 2016 was actually paid in 2016 but then I was ill for what seemed to be most of January with a smorgasbord of illnesses that were floating around. I missed some time at work, plus my contract second job now has less hours for the moment. Am I worried? No, because we are in a position to not get worried. We’ve gotten to a position in our life where we don’t have to worry about keeping up with the bills just because we had some time off work. The expenses for the month of January were kept low too. We never went bonkers over the Christmas period and therefore never received enormous Christmas bills. It also helps that I’m not the kind of person that has to have the latest and greatest gadgets which blows an inordinate amount of money in the process. I never was the cool kid and maintain that to this very day. I’ve also reviewed the budget and to be honest, there’s minimal changes required. I increased health and beauty, healthcare and prescriptions and grocery. 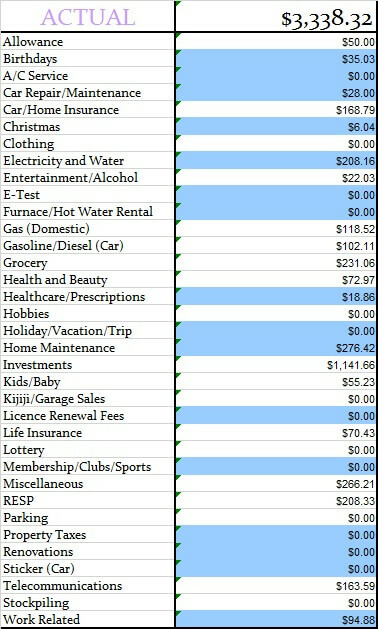 The results of last years spending actually fell inline very well with our monthly budget total. Our savings of 47.51% includes savings and investments and emergency savings for this month. If you include the projected expenses savings, we actually saved 72.31% of our income. That’s $5737.13 going into savings or investments of some description or another. The other categories were well within the defined percentage limits. Our projected expenses this month is at 24.80%. Time for the juicy category numbers and to see how we made out with our monthly budget. Below you will see two tables, one is our monthly budget and the other is our actual budget for the month of January 2017. This budget represents 2 adults and a toddler plus our investments. Here are our February 2017 goals along with whether we completed tasks from January 2017. Call around to lawyers to talk about getting a Will written up- Will is almost completed. Finish the master bathroom shower- I was hoping to start this in January however I’ve been asked to work more than I thought now. Coming into March I’m working more hours again. Buy a new blind for the garage- Fail It’s just not a huge priority but it’s hanging on. I’ll get there. Finish the walls in the baby room- We sold the change table and more money than we paid for it. We haven’t done anything else since. Purge our clothes little by little– Mrs. CBB went through all of her dressers and purged clothes, then donated them. Get the van undercoated- We decided not to do it this year. Find some nice friendly personal finance bloggers to guest post while I’m gone- Message me if you want in!! 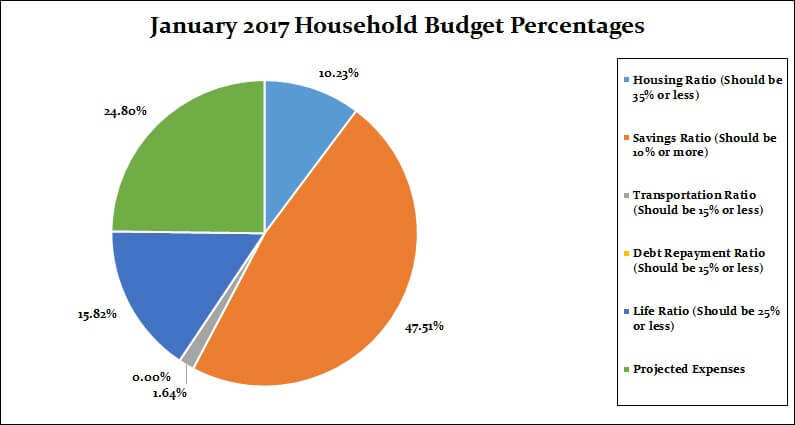 That’s all for this month check back at the beginning of March 2017 to see how we made out with our February 2017 budget. I have a problem with your budget software. I’ve set up all the expenses and income but it seems that for every expense that I enter in the line, the amount for “Spent too much/money left over” keeps saying I’ve spent too much which makes absolutely no sense. If I don’t enter in any expenses, I have $0 money left over. For example, my budget is $6,000. I enter in monthly total expenses of approximately $2,800.00. Income is $6,300. Next projected savings say $6,000 (which equals my budget) but then it says that I’ve spent too much of $2,000. I though formula is wrong but I can’t seem to figure it out. Can you clarify? Is it possible for you to send me a screen shot of your issue? 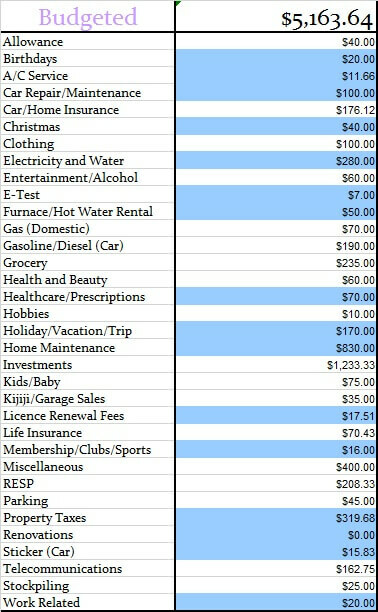 I think you’ve got the projected expenses set way too high, Projected expenses for us are things we know will occur during the year but choose to put money away every month for that item. It’s not a monthly occurring expense otherwise we would just list it as an expense. 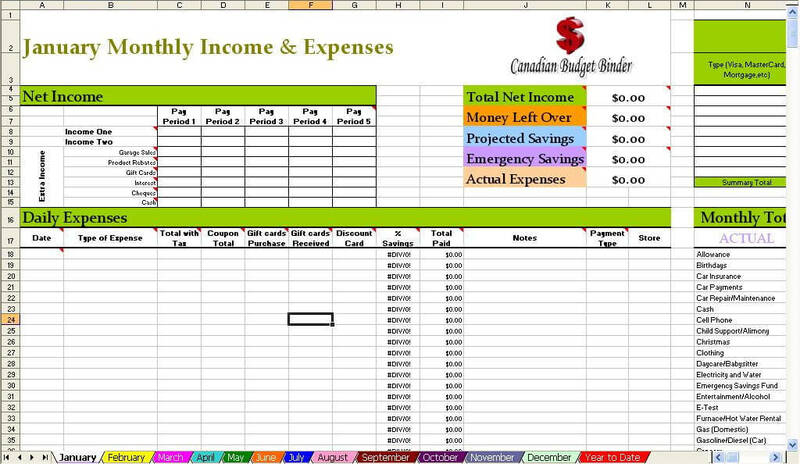 I set up the excel file so you can choose whether to use the projected expenses or completely ignore it. My budget organizing system has a few different tools…built up over time. I went from “the giant pile of paper” in the side room, archived in the dresser drawer upstairs when it starts falling over, which then got dumped into a paper box when it was full. What a nightmare! I got converted to become more organized 3 years ago, out of a need to become accountable to myself. 3, 13 pocket organizers with closures (no spills, nice and neat and easy to grab) — I usually buy if I need them in January and February if I need to as this is “tax time” and mini-back to school. A lot of the stores have these featured on a weekly sale. I also use a standup file holder with top loading file folders that are labelled (the contents move into the year end pocket organizer,) re-used year to year. I buy inexpensive clearance duotangs for keeping my printed budgets and year end reports, reference materials. A coupon wallet, pocket small organizer for things like coupons and gift cards. A waterproof fireproof safe to hold the important things that can’t be easily replaced. 1 — 13 pocket organizer to hold weekly receipts as I go along through the month for every purchase. I print my spreadsheets that show how I am saving and put the receipts in one pocket per week. It also contains articles I’ve printed, budgets (monthly and yearly), last month’s synopsis. I can stash the coupon organizer in here also. You could put all the monthly, semi-annual bills in there as they are paid, if it’s easier. 1 — 13 pocket organizer to hold each months weekly receipts (but not monthly expenses like hydro)….just in case I need to reference. I label each tab and have a spare. This gets cleaned out and re-used month to month. In January 2017, I get rid of last January 2016’s receipts and put in this January 2017 receipts from the week-to-week pocket organizer above. I keep them a year so I can pull items for warranty (one example, getting new work boots after they blew out in 5 months. Saved myself $170 there, who knew work boots have warranty? Same with a dog tie-out, lasted 11 months, got replaced so saved myself $45.) Because these are the weekly receipts, I get rid of the January 2016 receipts when I add the January 2017 receipts. Standup file holder for month to month accounting — storing the gas receipts, taxes, insurance papers (house and car), hydro, anything big that I might want to access in a pinch. It gets really jammed, and I add receipts and papers from the front so that the oldest are in the back. All top-loading files are labelled by expense or category such as semi-annual (car, house, taxes) Line of Credit, credit card statements, bank statements etc. Cleaned out annually and moved to the yearly pocket organizer, then stashed for reference. Except for warranty items, which stay in the back of the monthly organizer until they have warranty no more. 1 — 13 pocket organizer for “year end”…keeping the receipts for car repairs, banking, monthly bills, etc. It gets filled from the standup file holder and stored in January with a years receipts. These are things you want to keep but don’t need to get into every month. My budgeting organizer system works for me as it’s a mashup of old fashion paper, electronic reminders and tools. That and reducing the amount of time maintaining it or looking for copies. I use spreadsheets to ensure my math isn’t wrong (it keeps me honest with myself). My cell phone is my mobile organizer and calculator. I find it hard to carry paper flyers, lists, etc. and remember what I need to like reusable bags. I no longer worry AT ALL about incurring interest charges from missed payments, missing opportunities for savings. I can look up receipt information to show anybody any expense at any time. I can budget ahead and plan for expenses. I can see where costs have gone up or down. It’s very liberating, also so much less time consuming. Making your system make sense to you is all that matters. Thanks for the encouragement! Having different ideas helps to get to the destination…It wasn’t a lot of work to set up nor a lot of money. I built it over time and don’t dedicate a lot of effort for upkeep. A little time here and there makes for an organized system. I don’t have expenses related to missed bills or opportunities anymore. That was the goal. The journey continues. I downloaded your budget spreadsheet and it seems better that what I currently have. I will try to follow your tips and make some necessary changes to fully it with my budgeting. Thanks Mr CBB! Awesome that’s great Kelly. Let me know if you need any help at all.